• Flexible functionality for any occupant, owner or tenant. • Walk in entry level to offices for visitors and employees. • Street level office entry provides a better corporate image. • Better flood protection than grade level alone for inventory and office equipment. • Savings in the cost of fill over full dock high construction. • Efficient cross dock operations where receiving requires truck or rail car unloading and shipping must be street level. • Floor drains and sloped piping to discharge basins can be built in to the structure. • Increased real estate resale value and marketability to a wider range of users for sale, lease or sublease. Designers who have the skill in designing freestanding office/warehouse buildings and structures in industrial parks can specify a floor level about two feet two inches above grade. Where truck loading is required, a shallow truck well can be planned. For street level access, a gradual ramp can be constructed. Both wells and ramps should be long enough for level and safe use. Sump pumps are a good feature for truck wells. Street level access can be designed for the front of buildings with dock high loading facilities in the rear. Alternatively, each end of the building can be a different level. Future changes in use can be accommodated by simply filling in truck wells and installing gradual ramps or digging shallow truck wells. 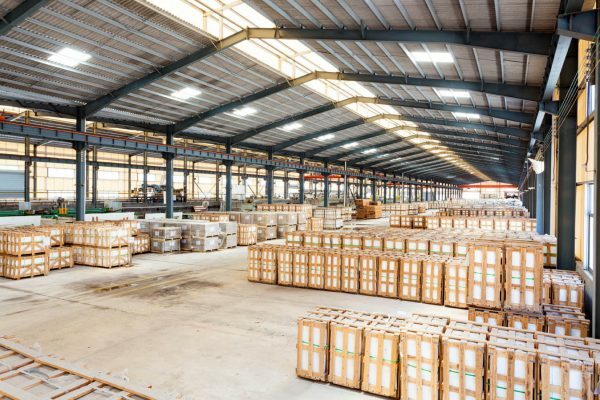 Warehouse/office buildings with flexible access heights can be used by a wider range of businesses resulting in better efficiency, flexibility and resale market value.